French perfume royalty Guerlain have explored many war-inspired themes in their vast 185 year history – from the iconic 'eagle flacon' of Derby (which was said to be inspired by Samurai armor), to the beating drums of surrender in Chamade. But perhaps the most literal to date has been Coriolan; a masculine scent inspired by the famed Gaius Maximus Coriolanus, a Roman general who went to war in the 5th Century BC. 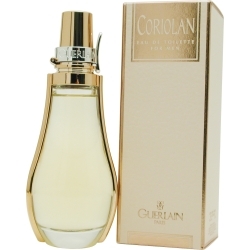 Coriolan was launched in 1998 in a flacon of glass and copper-coloured plastic intended to emulate the shape of an antique gunpowder flask. The scent itself - a tribute to raw masculine energy - is a woody chypre. It captivates with its classic topnotes of lemon, lime and petitgrain, but takes an unexpected turn moments in, as it veers off with supporting notes of sage, fennel, nutmeg, ylang-ylang and coriander. A very unique, aromatic blend, Coriolan is underpinned by a base of patchouli, leather, amber, vetiver and mosses. It feels vast, as if marching across open fields with a clear firmament overhead. There is an autumnal quality too, which suggests crisp air and the crunch of copper-coloured leaves underfoot. Coriolan is a surprising masculine which breaks away from convention and forges new territories, much like the war hero it was named after. It has remarkable longevity, and is excellent for both casual or formal wear. Omani perfume pedallers Amouage sure know how to bring the luxury! Their astonishing perfume portfolio is bursting at the seams with scents full of components both rich and rare. Few houses explore opulence and excess in the same fashion as Amouage does... so what better name to bestow upon one of their most notable masculine creations, than Gold? 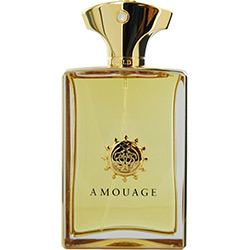 Amouage Gold for men is loud, self-assertive and unapologetic. It exudes a commanding aura that elicits your attention. Blended in a time-honoured style very much in keeping with Middle Eastern perfumery, Gold man is a titanic floral musk scent that you will quite literally smell at 10 paces! Rose hip, lily of the valley, orris and jasmine make for a daring flowery opening, whilst myrrh, leather, incense, mosses, musks, civet and precious woods provide the sturdy backbone upon which Gold is built. When its dazzling florals and woody notes recede over time, they reveal a powdery, soapy quality... one which feels clean and very dense. Amouage Gold has monumental sillage, and will last the better part of an entire day. This fragrance is suitable for any time of year, but one would have to be choosy about where it is worn. But if its a grand statement and maximum impact you'd like to make, the Gold delivers on all counts! As far as perfume is concerned, the d'Ornano family at the helm of the Sisley brand, have always managed to command the senses with their scented creations. In 2009 the French aromatics and phytocosmetology giants launched a new trio of fragrances under the Eau de Sisley umbrella, simply named 1, 2 and 3. 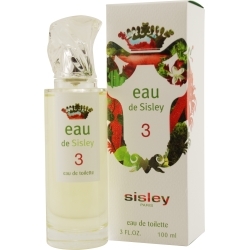 Eau de Sisley 3 is a standout in the trio, and a scent intended for both men and women. It opens with a rush of citrus: lemon, bergamot, mandarin and grapefruit... it is fresh and effervescent right out of the bottle. This opening is accompanied by a sharp, brisk ginger note which becomes a dominant feature. Number 3 is imbued with swathes of breezy osmanthus, green vetiver and musks. Lovers of Issey Miyake's 2004 release L'eau Bleue d'Issey will potentially encounter a similar journey here, as Sisley takes us to the sun-soaked Mediterranean. Whilst not listed in the notes, Sisley 3 has unique characteristics that bring to mind the odour of damp cypress, tree sap and pine needles. It tenders a sense of cool, crisp green, and is full of abundant sunshine. Sisley 3 is excellent for summer days and nights, or in casual situations. It can be worn with mad abandon, and remains in keeping with other Sisley fragrances... that is, it evokes a sense of nobility, but in a far more relaxed manner. Lalique have made themselves a household name, and have placed a bookmark between the pages of history with their magnificent sculptural glass. In the late 1800s to the mid 1900's, they set the benchmark in creating exquisite and highly coveted perfume bottles. Its a little surprising then, that it was only in the early 90's that they began producing their own fragrances. Encre Noire is a scent for men, launched in 2006, that has remained at the pinnacle of their collection. 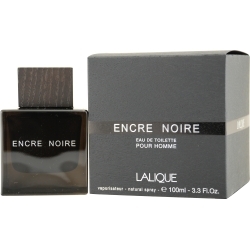 Encre Noire (or “Black Ink”) is an aromatic woody fragrance with a distinct masculine presence. It is packaged in a heavy black glass flacon with wooden cap, perhaps inspired by an antique ink well. It opens with a sappy green burst of cypress which lends a pine-like mediterranean greenness. The heart is composed of earthy, rooty vetiver... more green... but with the odour of damp soil attached. A dark woody base of cedar, amber and musk give the impression of a moisture-laiden forest floor. Encre Noire is indeed an ebony-coloured olfactory experience, and one that many men of any age would relish. This scent is perfect for office wear, or for evening excursions. Sophisticated, refined and classy, Encre Noire has it in spades. Italian fashion giants Fendi have been wowing fashionistas and fragophiles for decades with their striking silhouettes, materials and fine perfumes. Fan di Fendi, launched in 2010, represents yet another feather in their heavily-monogrammed cap! 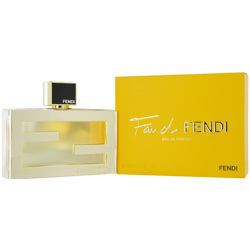 Right out of the gate, Fan di Fendi smells expensive. It resides in the same universe as Chanel's Coco Mademoiselle... a fruity floral scent with depth, sophistication and complexity. The opening comprises pulpy tangerine, pear and juicy blackcurrant that stew over a nucleus of opulent jasmine and rose. It feels flirty and vivacious, but classy and well-mannered at the same time. A glimmer of carnal tuberose and a patchouli / leather facet suggests that this kitten, in fact, has claws; revealing something of a darker side. Fan di Fendi is two parts Urban Chic, and one part Femme Fatale. She dances along the line between straight-laced compliance, and Va-Va-Voom! 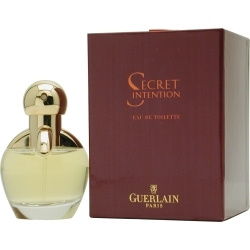 A perfume for informal occasions and romantic nights. The flacon itself is made of heavy glass, flanked by two iconic “F's”. It is uniquely chic, uniquely Italian, and uniquely Fendi. Since Gianni Versace's tragic murder in 1997, ownership of the Versace brand was kept in the family with control promptly turned over to Gianni's siblings, Santo and Donatella. Since then, the Versace legacy has been preserved and the iconic fashion house continues to produce fashion, accessories, homewares and perfumes that capture the eye and rouse the nose. 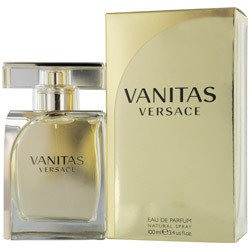 Vanitas is a soft feminine scent, launched in 2010. Presented in a rectangular flacon with swathe of gold over its shoulder, Vanitas is prettiness personified. A delicate flight of rose and blushing freesias send the scent into an orbit of flowers... a feminine heart of sheer osmanthus and tiare blossoms add more satiny girliness to the composition. A hint of black tea and cedarwood in the trail manage to ground this lovely, sunny perfume. Its hushed, delicate nature can be nothing but feminine. Understated and charming, Vanitas is a great go-to scent for summer days. Despite her apparent weightlessness and transparency, Vanitas stays on skin for 5-6 hours. A smart/casual solution for women who are young, or young at heart. Bvlgari have been pedaling their eye-popping jewels for almost 130 years, but their first foray into fine fragrance in the early-mid 90's, is relatively recent by comparison. Their debut feminine scent Bvlgari Femme stepped onto the world stage in 1994, and was an instant hit. Since then, it has sparked a number of flanking perfumes, one of which is the very pretty Voile de Jasmin, a limited edition from 2006. Voile de Jasmin (Jasmine Veil) is every bit as delicate and sheer as it sounds. A floral scent in every sense, Voile de Jasmin has used facets of Bvlgari Femme as its basic building blocks, but has been transformed into something more airy and diaphanous. It opens with sunny mimosa, but the starring role goes to its pretty florets of Jasmine Sambac that the perfume is steeped in. It feels luminous and yet powdery in equal measure. Its appeal perhaps lies in the very fact that it remains weightless and gauzy, but still manages to blanket the skin like an ivory cashmere blanket. Voile de Jasmin is a beautiful, tender rendering of femininity in all its forms. Unassuming and restrained, it can be worn every day, or relished on special occasions. 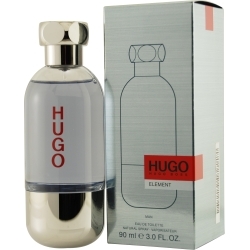 Hugo Boss seem to have cornered the market with their inexpensive masculine scents that have wide mainstream appeal. I've seldom seen a college dorm or high school dressing table without at least one Boss bottle! Hugo Element, launched in 2007, exemplifies the 'fresh, cool and clean' genre that appeals to the teens and twenties of today. Element was created for the young urban man – a social guy with his friends, his sporting pursuits, his outings and his mobile devices. Composed of aquatic accords and citrus, Element is a go-to eau de toilette for a guy on the move. Crisp ginger, green vetiver and clean musks all add to that 'just-stepped-from-the-shower' vibe. This fragrance is excellent in summer, or for daily wear when being active. Casual, energizing and fresh. 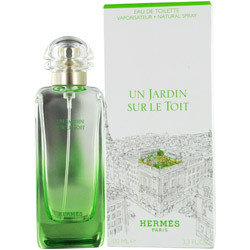 In an expanding series of unisex 'Collection Jardin' fragrances, Hermes added a fourth scent to their collection in 2011, namely Un Jardin sur le Toit (A Garden on the Roof). The name and perfume itself is a reference to the striking and luxurious garden that can be found on the rooftop of the Hermes flagship store in Paris, at 24 Rue du Faubourg Saint-Honore. Perfumer Jean Claude Ellena took a stroll through the garden and wished to capture the odors of abundant green. The rooftop is covered in aromatic herbs, fruits and flowers – many of which have made their way into this sun-drenched scent. Un Jardin Sur le Toit feels somewhat linear from top to bottom. It has a mouth-watering opening of juicy pear and crisp red apple that can be felt right into the drydown. A scattering of rose and magnolia give rise to a sense of femininity, although the perfume's gender is kept in check with earthier notes of green grass, basil and compost. This eau de toilette has an uplifting, invigorating quality that serves as the perfect pick-me-up in the warmer months, or when one craves a little sunshine throughout winter. Beautifully composed, and presented in a stunning flacon of graded green, Un Jardin sur le Toit is one to be experienced.